The ideal situation for a landlord is remarkably simple: to have low-maintenance tenants that take care of your property and respect your space, pay rent on time, and…well, that’s actually about it. As convoluted as rental situations tend to get, the truth of the matter is that many lease contracts are fulfilled without any issues. If you own rental properties as a form of income, a smooth tenant experience is about all you can really ask for. 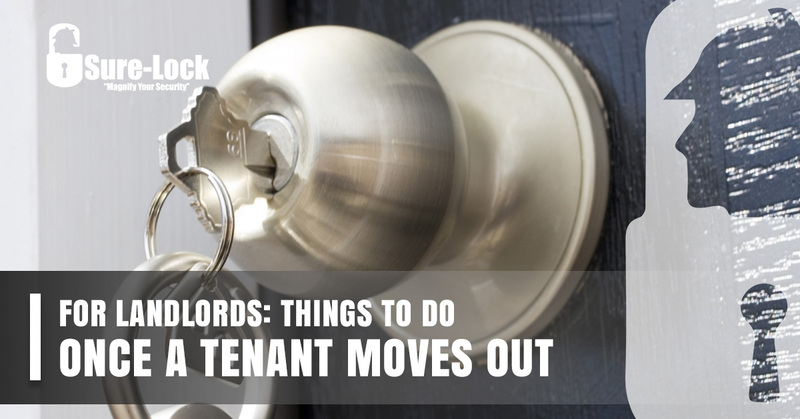 Once the renters of your property decide to part ways post-lease, you should do a number of things to “turn around” your apartment or house before the next tenants move in. As far as your property’s locks are concerned, the team at Sure-Lock Locksmith in Naples has you covered. If you have any custom locksmith needs in Southwest Florida, don’t hesitate to call us at 239-260-4818. Below, you’ll find a few pertinent items that all landlords should attend to when tenants move out. Naturally, you can’t just trust that your tenants took pristine care of your place, even if they’re good people. If you’re diligent then you probably took “before” photos of your property — as did your smart tenants — so that blame for anything that’s damaged isn’t improperly assigned. You’ll want to ensure that all aspects of your property are entirely functional for your future tenants to use and enjoy. This includes various items such as light fixtures, walls, floors, smoke and carbon monoxide detectors, appliances, electrical outlets, windows, cabinet hardware, and so forth. The more nit-picky you are, the more trouble and time you’ll save down the road. If you’re in a hot market for rentals, you’ll probably have no problem finding decent tenants. Depending on market conditions, however, it may be time to raise the price of rent (to the dismay of renters). When tenants remain in your property, it’s easy to keep rent at the same price because you don’t have to deal with this whole process of turning your property around. Even if your previous tenants were good people that returned their keys to you, there’s no telling whether or not they had additional keys cut. Not only does this ensure the safety and security of your future tenants, but rekeying your locks guarantees that you’re the only one with access to the property. Improving your security is a worthwhile investment that’s only going to add to your property value and equity. Not only will your future tenants feel good about it, but your wallet will feel good about it, too. Contact Sure-Lock Locksmith In Naples Today! For a reliable residential lock and key expert in Southwest Florida, look no further than Sure-Lock Locksmith. Get in touch with us today. Learn More About Our Residential Locksmith Services Here! With more than 20 years of combined experience, we have the expertise needed to get the job done right the first time. Commercial and residential services are available 24/7! Contact us today for a free security survey of your home. From Naples, Ave Maria, Fort Myers to Marco Island and the surrounding areas, we look forward to securing your Florida home or business. Reach out now. ©2018 Sure-Lock Locksmith LLC - Do not copy. All rights reserved.